Score your own winning field goal with this high-flying experiment. Put your science, technology, engineering and math skills to the test and create a catapult to see how far you can launch a mini football. Never aim your catapult at people or pets. While every reasonable effort is made to provide experiments that are safe, adult supervision is recommended at all times when experiments are performed. Safety gear, such as gloves and glasses, may be required. Paint, markers, googly eyes, sparkles, etc. 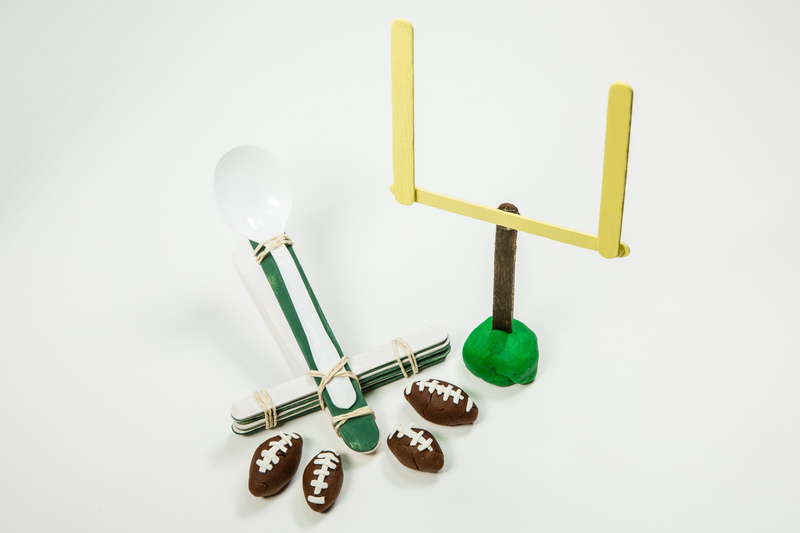 Things to launch: mini footballs, erasers, pompoms, mini marshmallows, coins, buttons, etc. Colour your wooden sticks with paint or marker and let dry. Take 8 small sticks and stack them on top of each other. Wrap a rubber band around one end of your stack. Slide 1 large stick to the middle of the stack between the bottom two sticks. This is the base of your catapult. Wrap a rubber band around the other end of the stack. Take the remaining large stick and place it on top of the stack so it lines up with the other large stick. The stick on top is your launcher. Wrap a rubber band around the short end of the two large sticks to hold them together. Wrap one rubber band around the middle of the big stack and the two large sticks, and then the other rubber band, making an X. Slide the plastic spoon under the X and secure the base of the spoon to the launcher with another band. Place a launch item on the spoon. Pull the spoon down and release! Colour your sticks with paint or marker. Use 2 sticks to make a capital “T”. Glue them together where they touch. Attach the remaining sticks to each end of the “T” and glue. Have someone hold the goal post while you launch or stick it into clay. When you pull the launcher down, it stretches the rubber band. The band is loaded with stored energy called potential energy (that springy-ness you feel as you hold the launcher down). Let go and the catapult changes the potential energy into motion called kinetic energy and transfers it to your launch object. How far your object flies depends on its weight and size, as well as how much potential energy is stored before launch. Using more advanced science and technology, engineers at SRC design and build machines and tools for industry that generate electricity from the sun and wind, find tiny diamonds in giant piles of rock, extract oil from below ground and monitor the environment. What happens when you launch a heavy, light or large object? Or if you launch more than one object at a time? Try a few different items to see how far they go. Add more sticks to the large stack to see if it changes your flight. Use a measuring tape to record the distance. You can also try moving the spoon or add another spoon.